It’s incredibly rare that I ever admit I am wrong, but today I concede to the fact I am. As any regular readers of my blog will know I am pretty obsessed with the brand Horrockses. 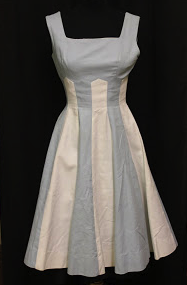 In 2011 I did some pretty in-depth research into the delightful dress below which had once been owned by Lucienne Day. 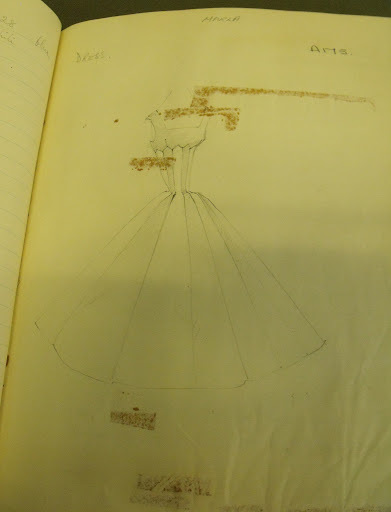 I had always suspected with its complicated construction that this dress had been designed by John Tullis. On Wednesday I found concrete proof that I had infact got the designer of the dress incorrect : o!!! If you are interested in the full story behind the dress (ignoring the part about John Tullis!) youcan read it here. So how did I find out I was wrong? 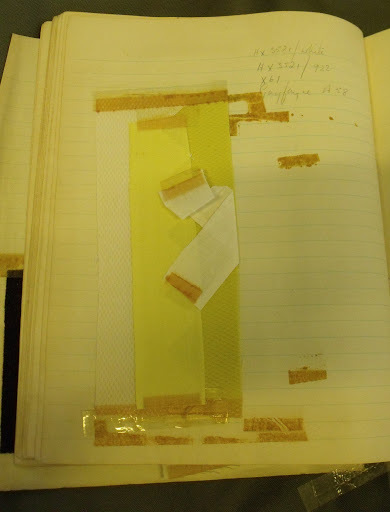 I was visiting the AAD at Blythe House, and decided to have a look through some of the sketchbooks that had belonged to Betty Newmarch who was one of Horrockses fashion designers (along with Marta Pirn anD John Tullis). These three sketchbooks were filled with a veritable wealth of information and have allowed me to date a number of dresses I own more accurately. In the book dated Summer 1956-57 I came across this sketch. IT’S THE ORIGINAL SKETCH AND FABRIC SAMPLE FOR THE DRESS!!!! As an interesting aside the sketches were not actually drawn by Betty Newmarch, but by her sketch artist Patricia Hunter. Sadly, as of yet I have not found any information about Hunter, but it would appear most of the distinctive sketches associated with Horrockses were infact drawn by her. I suppose I had always assumed that the fashion designer would complete the sketches themselves in this period, but it would appear not! 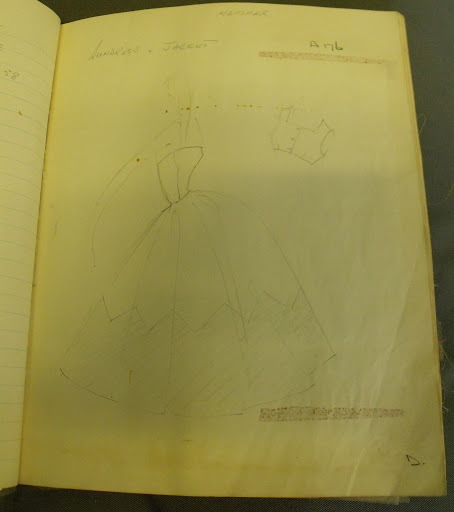 So back to the dress, what I also found interesting was that there were quite a number of these extravagant pique cotton dresses scattered through this sketch book, and it appears that when dresses were left plain this was a “go to” fabric for Horrockses. This is another example of a similarly delightful sundress and bolero using white and yellow pique cotton. 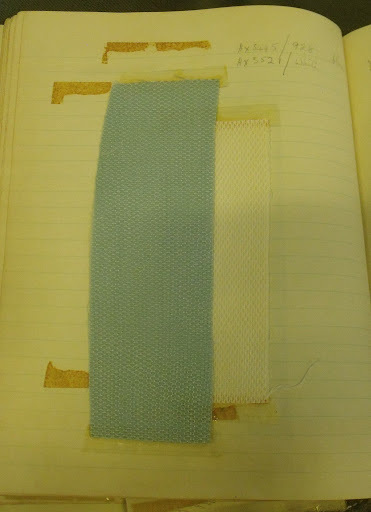 A housecoat later on in the sketchbook (also made from this pique) is illustrated as being “made exclusively for Simpson’s Picadilly”. It is interesting to note that a number of dresses had certain shop names written above them, suggesting that they were produced exclusively for a particular shop. So what has this taught me? The value of research, for sure and also that your instincts (however strong) aren’t necessarily right.